Britain was the world’s leading industrial power for most of the 1800s. 19th Century industrial production relied on coal–it powered factories, heated homes, and was essential for producing steel–and as an industrial power Britain relied on coal to make it great. Most British coal was used domestically, but some was exported to support burgeoning industrial needs in other parts of the world. Charles Joseph Minard, the well-regarded economic cartographer, produced this excellent map of British coal exports for the year 1864. As with most of Minard’s works, this map relates the thickness of each export line to the amount of coal it represents. Here, each millimeter of thickness represents 20,000 tons of coal. The numbers written over or beside the lines represent the total number of tons of coal, in thousands. Click here or on the picture above to see the full map. 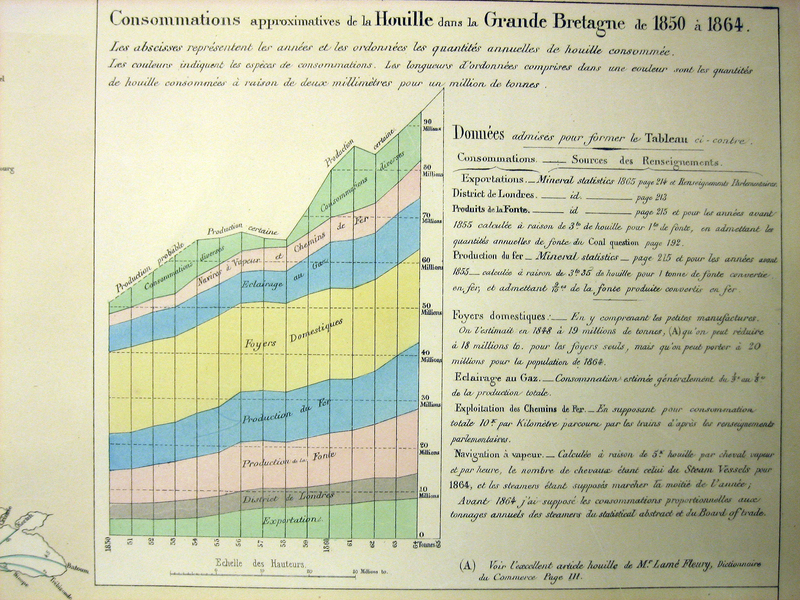 Minard also included a fascinating graph of the eventual uses of all British-mined coal in the upper right. More on that graph later. The map clearly demonstrates that the majority of British coal exports were destined for use in Western Europe–in Italy, France, the Netherlands, Belgium, the German states, and Scandinavia. A smaller but still significant amount was exported to Russia (via both the Baltic and Black Seas) and the Ottoman Empire. The coal that was not shipped to Europe was distributed across the remaining five populated continents, but not evenly: Australia and Africa (with the exception of British-controlled Egypt) imported hardly any coal at all, whereas China and India imported much more. South America also imported a significant amount of British coal–much of it to Brazil, Chile, or Peru. Canada and the United States imported a relatively small amount–the former possibly due to its lower population, and the latter probably due to large domestic coal production. 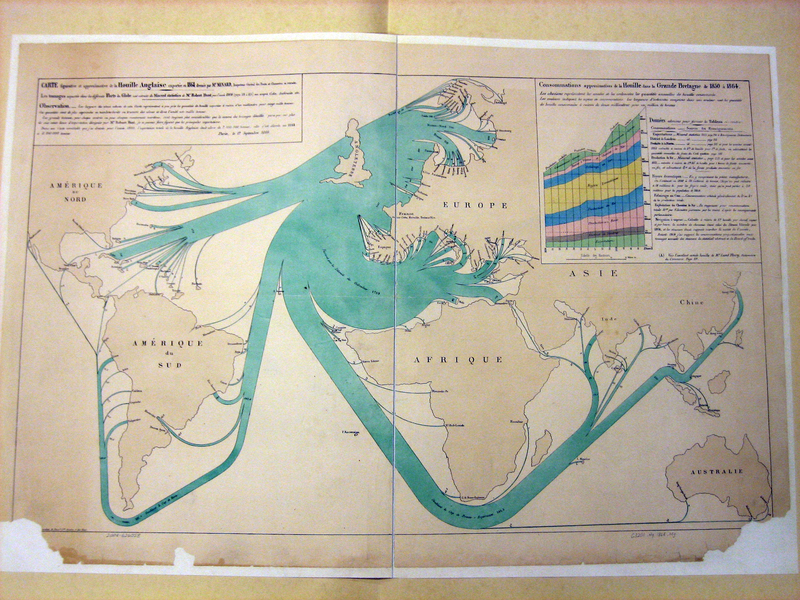 The map show some interesting details about international trade during the mid 1860s. Malta, Singapore, and especially Cuba imported large amounts of coal given their relative size and levels of industrialization. Malta and Singapore, at least, were British colonies; but Cuba was a Spanish possession, showing how much the dwindling Spanish Empire had come to rely on foreign industry to sustain itself. Though St. Petersburg was the Russian capital at the time, the majority of Russian coal imports from the Baltic Sea were instead destined for the city of Kronstadt, located on an island off the coast of St. Petersburg. Kronstadt was the headquarters of the Russian Baltic Fleet, and its steam-powered battlecruisers consumed coal at a tremendous rate. Prussia’s growing power in Germany is shown by the amount of coal it imported from the Baltic, peeling off into multiple ports. But Minard also indicates that a rather large amount of coal was still being imported to the German North Sea ports and destined for the “Villes Anseatiques”–the cities of the old Hanseatic League, a Renaissance-era trading guild that had become defunct in all but name in the 1600s. Interestingly, however, the German cities of Lubeck, Hamburg, and Bremen maintained the pretenses of the League until 1862–only two years before the data for this map was gathered. It is unclear whether Minard refers to the imports of the last three cities, or of a collection of older member cities. At the very least, the use of this nomenclature shows the continuing decentralization of Germany, which would not change until German unification under Prussia at the beginning of the next decade. Finally, the map also shows the continuing economic importance of the Caribbean islands. More coal was imported by those small specks of land than by the rest of North America combined. Minard also included an interesting chart in the upper right-hand corner of the map, showing the amount of British coal produced for each year between 1850 and 1864, and how it was used. Click here or on the picture below to see a close-up of the chart. The graph shows the tremendous changes in coal production over only a decade and a half–an increase of nearly 100% from just over 50 million to nearly 95 million tons. Of this, less than 10% was ever exported–meaning that the British domestic market was consuming nine times as much coal as is shown as exported in the main map. The major uses of British coal, according to the chart, are: the production of iron (“Fer”) and cast iron (“Fonte”), gas lighting (“Eclairage au gas”), steam engines in ships and trains (“Navires a Vapeur et Chemins de Fer”), and domestic fireplaces (“Foyers Domestiques”). A large amount of this production was also specifically slated for use in London, showing how that city was the major center of British industry. This is the second post in our continuing “Mondays with Minard” series, exhibiting Charles Joseph Minard’s excellent cartographic handiwork. This map was photographed specifically for use here at Cartographia from the collections of the Library of Congress. Feel free to reproduce the map in any way you wish, but please cite us as the source. The original map is in fairly good quality, but I ran the picture through Photoshop to improve the contrast and make the colors more vibrant for the sake of clarity. An outstanding share! I’ve just forwarded this onto a colleague who was conducting a little research on this. And he actually bought me lunch due to the fact that I found it for him… lol. So let me reword this…. Thank YOU for the meal!! But yeah, thanx for spending some time to talk about this issue here on your web site. artists can manufacture their own positive reviews! You should thoroughly investigate any online market resource before using it. Take random positive feedback with a healthy grain of salt. You will want to lend greater weight to reviews you find from truly trustworthy, unbiased sources. Hello, Neat post. There’s an issue together with your website in internet explorer, would check this? IE nonetheless is the marketplace leader and a big section of folks will miss your wonderful writing because of this problem. site yourself? Please reply back as I’m looking to create my own personal website and would like to find out where you got this from or what the theme is named. Thanks! most of them, of course, are unsubstantiated by evidence. there are also numbers that oddsmakers put in that make it either easier or more complex for favorites to cover. found this web site as a finest siite for hottest updates. Hello to every one, as I am truly eager of reading this weblog’s post to be updated on a regular basis. III Câmera Canarinho dentre Pressão alta.